Syria’s UN Ambassador says his country’s retaliation for Israel’s airstrikes "changed the rules of the game". 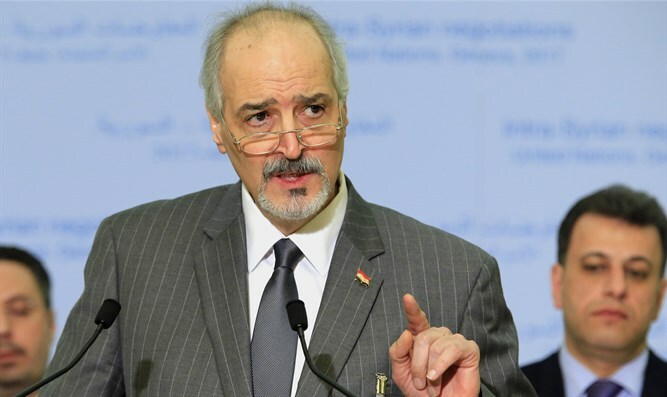 Syria’s Ambassador to the UN, Bashar Al-Jaafari, said on Sunday that his country’s retaliation for Israel’s airstrikes overnight Thursday was appropriate. "The Syrian response was appropriate and changed the rules of the game. Israel will think long before taking similar action in the future," Jaafari told Hezbollah’s Al-Manar network, according to a translation provided by Channel 10 News. The ambassador further claimed that Israel intervened in the war in Syria because of the Syrian army's progress in the fight against the Islamic State (ISIS) jihadist group. Israel on Thursday night attacked targets in Syria, in what Prime Minister Binyamin Netanyahu later said was a shipment of weapons meant for Hezbollah. No Israeli soldiers were hurt, despite Syria’s claims that it downed one of the Israeli aircraft. Syria reacted angrily to the Israeli airstrike and threatened to respond harshly. Jaffari’s comments followed reports in Syria, which said that an unmanned aerial vehicle operated by the Israeli Air Force opened fire on a car near Kuneitra on the Syrian side of the Golan Heights. According to the reports, the driver of the vehicle, who was not identified, was eliminated in the attack.